McCoy: "Fantastic machine, the M-5. No off switch." William Marshall did a good job as Daystrom, with the gravitas and big, deep voice. It was easy to feel pity for his Frankensteinian madness even while also feeling exasperation. He even managed to pull off a periwinkle jump suit with orange sleeves, no small feat. Daystrom actually seemed to believe that serving on a starship was a hazard that human beings would want to avoid. Clearly, he did not grow up a science fiction nerd who would have killed to serve on a starship. Maybe he was thinking of the poor red shirts. At least Kirk didn't outwit the M-5 in the end with illogic. Four starships were saved because M-5 had been imprinted with human intelligence and had a conscience, and Kirk reasoned with it like it was a person. And the Enterprise herself was saved because of human emotion: Wesley's compassion kept him from firing, even though logic told him to go ahead. Computers bad, humans good, got it. It would have been an easy writing choice to have Spock take the side of the computer, and I'm glad they didn't go there. After showing some initial interest and enthusiasm, Spock correctly observed that an effective organization runs on much more than computer-like efficiency, and his loyalty to Kirk was unwavering. What if we'd discovered in the end that Daystrom had used a human brain to power M-5? I guess that would have been too big a move toward the horror genre for Star Trek, but it just always felt like the next logical writing step to me. The latest edition of Computers Gone Wild! You know. if computers in real life worked like computers on Star Trek, then my IPad would currently be plotting against me. STEVE JOBS IS GOD. But really, that would make no sense, these devices are simply tools. DID YOU KNOW YOU CAN DOWNLOAD GREAT CONTENT FROM ITUNES? Actually, this whole theme of computers replacing humans never made a lot of sense because it really hadn't advanced much since Mary Shelley wrote Frankenstein. The idea that we have created something completely alienated from us that will destroy us certainly hasn't gone away (The Matrix and Jeopardy-winning Watson being some recent incarnations of the same theme), and its only really now that we see the potential for a kind of symbiotic relationship with computers that can create tremendous potential for the growth of human capability and life. HA, WHO IS THIS GUY KIDDING? This episode of course doesn't get at any of this. Everyone can see the threat but the payoff just isn't visible in 1968, which limits the effectiveness of the message. There just isn't much temptation there to accept the computer. YOU KNOW, I CAN WRITE THIS REVIEW JUST LIKE HIM. THIS EPISODE IS ONLY OKAY, THE COMPUTER WAS MISUNDERSTOOD. INSERT SEMI-FUNNY JOKE, HA, HA. STAR TREK IS SEXIST. SPOCK ROCKS. KIRK LIKES KISSING BONES. UH OH, LAMENESS OF REVIEW CAUSING ENNUI, MUST COMMIT SUICIDE. I HAVE INSULTED FANS AND NOW THEY WILL DESTROY THIS REVIEW... wait, I am back in control of this review don't shoot, it was the IPad, which is... wait for it... The Ultimate Computer!!! — Stardate 4729.4, and Alpha Carinae 2. We saw four of Enterprise's sister ships: Excalibur, Lexington, Hood and Potemkin. 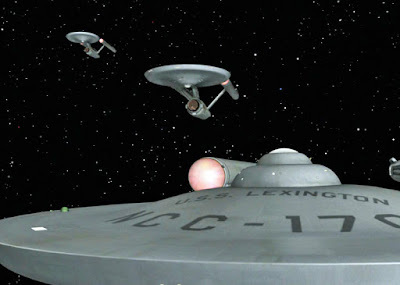 Five starships in one episode was pretty special, even if they were all identical. — Spock has an A7 computer expert classification. I would assume that's a high level classification. Although the '7' makes me wonder. — An unnamed ensign red shirt in Engineering was vaporized by M-5. — 2001: A Space Odyssey was released in 1968. I have no idea whether or not it came out in time to affect this episode. Maybe if it had, M-5 would have had a silky smooth, human voice instead of that mechanical one. Kirk: "There are certain things men must do to remain men. Your computer would take that away." McCoy: "Did you see the love light in Spock's eyes? The right computer finally came along." I don't know. Spock didn't look that happy to me. Spock: "Computers make excellent and efficient servants, but I have no wish to serve under them. Captain, the starship also runs on loyalty to one man. And nothing can replace it, or him." See what I mean? Not happy at all. 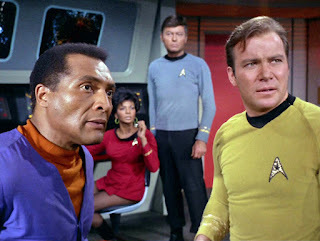 McCoy: "Please, Spock. Do me a favor and don't say it's fascinating." Spock: "No. But it is... interesting." Spock: "It would be most interesting to impress your memory engrams on a computer, Doctor. The resulting torrential flood of illogic would be most entertaining." McCoy: "Careful, Jim! He's on the verge of a psychotic breakdown." Kirk: (in Daystrom's face) "The M-5 must be destroyed!" This episode first aired in March but 2001 ASO opened in April. Of course, the episode was filmed earlier in. The year, and there was also talk of 2001 in the press. But not much, and no trailers -- it just isn't like today. I suspect there wasn't much cross pollination. It's kinda amazing to think about the leap they were making with this story now, considering that the spaceship computer used to take the Apollo 8 astronauts to the moon and back that year had 2k bytes of programmable memory and about 30k of read only memory. Not much room in there for m5. Today, a $10 memory stick has one million times as much memory and we still can't use computers to drive cars. Of course, we can't send people into space anymore, either. But I digress. It was a good episode, and someday, we'll create machines that destroy us and take over the universe. Or not. I have vivid memories of seeing this episode on its original airing at Uncle Joe & Aunt Josephine's house. They had a color TV--we did not--and seeing my favorite show in color was awesomeness squared.